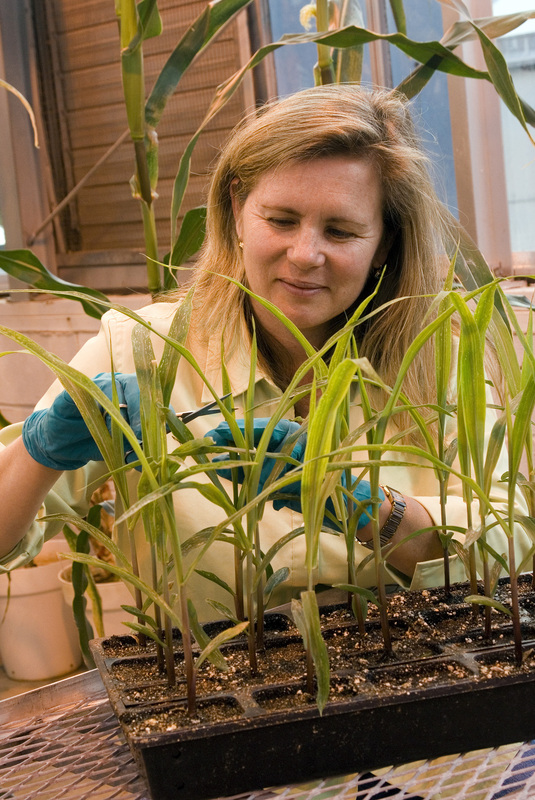 ARS molecular biologist Doreen Ware examines corn plants for their genetic information. Ithaca, NY (October 24, 2018) — Agricultural Research Service (ARS) scientists have identified networks of genes and gene regulators that allow plants to direct nitrogen to different parts. This knowledge may speed breeding new plant varieties to be more effective with how they use nitrogen, according to a paper published in Nature. ARS Plant, Soil and Nutrition Research Laboratory molecular biologist Doreen Ware and her team identified 23 proteins termed “transcription factors” that play specific roles in how plants make use of nitrogen. Ware traced these transcription factors back to the individual genes that control them and forward to the genes on which they act. Scientists have known that plants can actively redirect nitrogen to their different parts—roots, shoots, flowers and seed heads—especially when the amount of nitrogen available in the soil is limited. But until now, they had not identified the actual genes and proteins that add up to a plant-wide nitrogen regulatory system. Nitrogen is essential for plants. It is a core component for the growth of most plant structures such as roots, stems, leaves and seed heads. Globally, producers use about 200 million tons of fertilizer each year to boost crop yields. But nitrogen fertilizer is an expensive cost to farmers, and applied nitrogen not taken up by plants can leach or run off from fields and damage waterways and enter the atmosphere as a greenhouse gas. “What my team and our collaborators at the University of California-Davis (UC-Davis) have identified are plant gene networks that direct nitrogen to those places where the plant benefits the most when nitrogen is in limited availability,” Ware said. Ware also is an adjunct associate professor with Cold Spring Harbor Laboratory. As the scientists tease out the details of the system, they believe it may open up new avenues for breeding plants that respond in a particular way under different environmental conditions. “One day we may be able to precisely breed for specific plant types since a plant breeder could know exactly which genes need to be present so that a root vegetable will direct nitrogen to its roots first in times of limited availability or temperature change. Or, with crops where the important yield is in the seed head such as with wheat or oats, breeders would select plants with genes to direct nitrogen to seed heads first,” Ware added. The researchers also identified genes and transcription factors that help regulate other aspects of plant growth that involve nitrogen such as increasing height or stunting in plants, triggering the transition to flowering and other essential processes. If crop varieties that selectively direct nitrogen and other nutrients can be bred, it possibly could reduce the amount of nitrogen the farmers need to apply to maximize yield. Ware and her team used computational and molecular biological approaches to identify a set of genes and transcription factors they suspected plants might use to direct nitrogen. Then collaborators at UC-Davis tested those potential players in the field. This relatively new science of computational biology is making major strides at putting crop variety development on a more scientifically precise basis. Computational biology is the science of building models that allow researchers to integrate and analyze very large, diverse sets of experimental and field measurements to describe and/or predict how an organism will react physiologically. See more information from UC-Davis.